The original plan was to book five days in Malta. I obviously thought that was enough, but in hindsight another day or two would have been perfect. Technically, we only had three full days since we were late on the first and we had an early flight on the fourth. Still, there’s a lot more to see in Malta. Once you get there, there are two options to getting around. First one is via ferry, which is the fastest way. You can also go around via bus, but keep in mind that buses can be a bit slow. They may also sometimes be late. The only advantage buses have is that they can be convenient. If you will be staying for a week, for example, you can buy a Tallinja card that lets you ride all buses for 7 days. It’s just 21 EUR, or roughly 3 EUR per day. Normally, fare can go up to 3 EUR (night fare), and the unlimited week-long card offers great savings. Also, if you will be getting around, it’s best to download the Tallinja app for your smartphone. It’s a great help once you’re there! 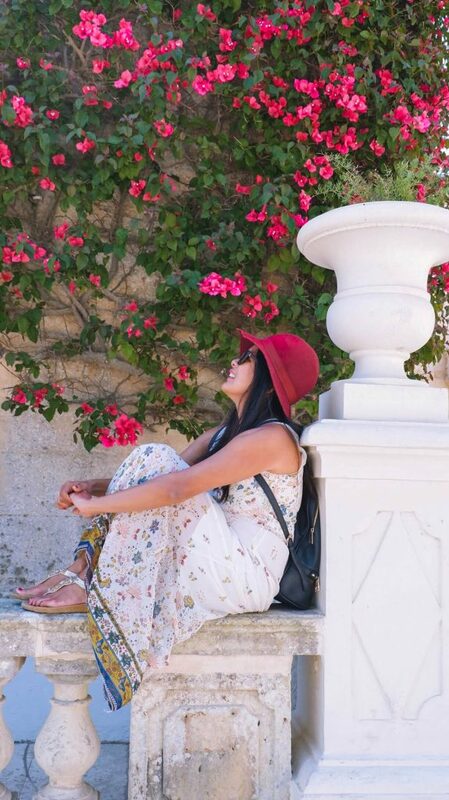 Now that we’ve gotten travel tips out of the way, it’s time to plunge into the highlights of our trip! 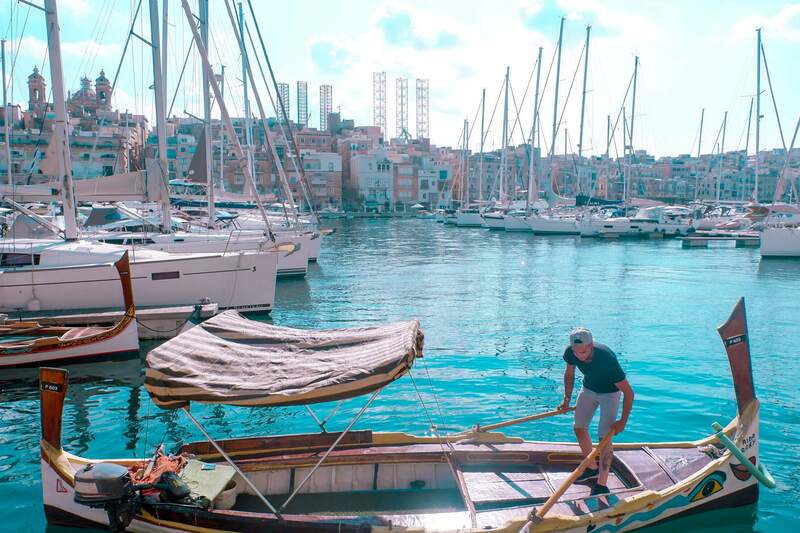 Our first stop on the first day was St. Julian’s, a coastal town in Malta’s central region. It’s a popular vacation spot just north of the capital. It’s the perfect place to grab a cup of coffee or some snacks, and just sit by the water as you watch people around you. The place also has a lot of cool coffee shops and some interesting restaurants. One of the highlights of the place is the inverted LOVE statue, which reflects in the water just beneath it! 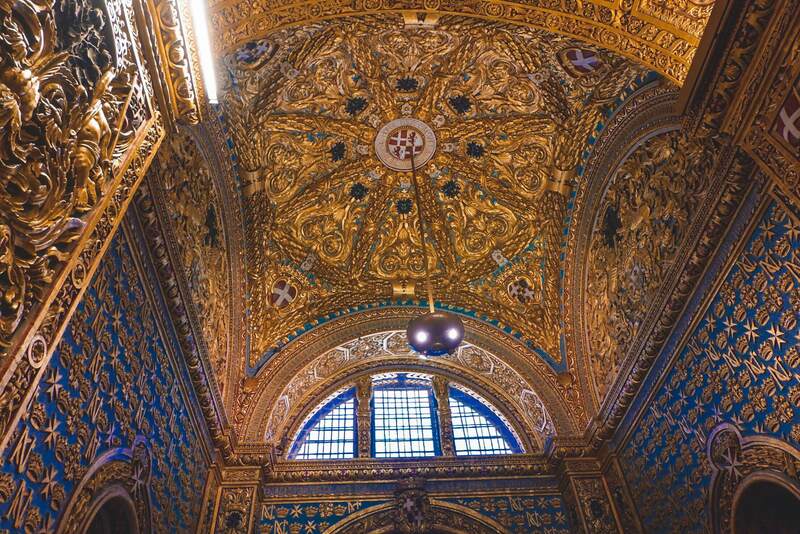 You can also visit the parish church which has an awesome design. 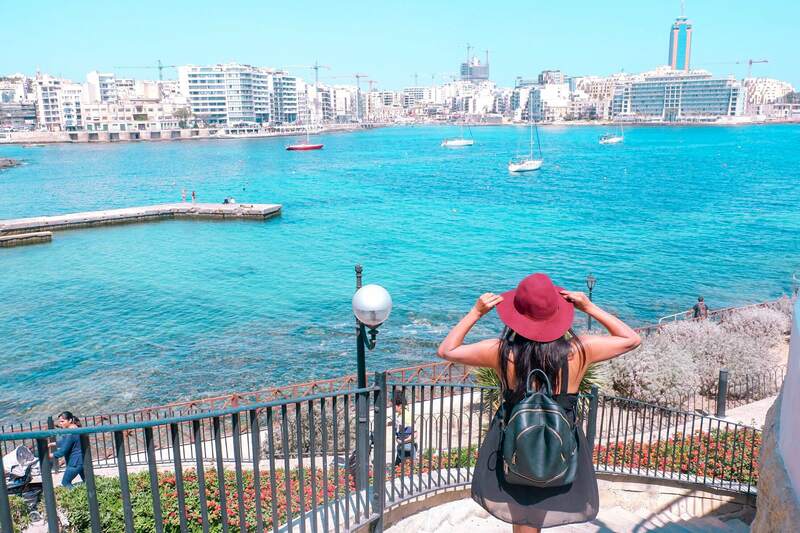 From there, we walked over to Sliema, which is just around a 15-minute stroll by the pretty coast. We passed a lot of ports and beaches along the way! 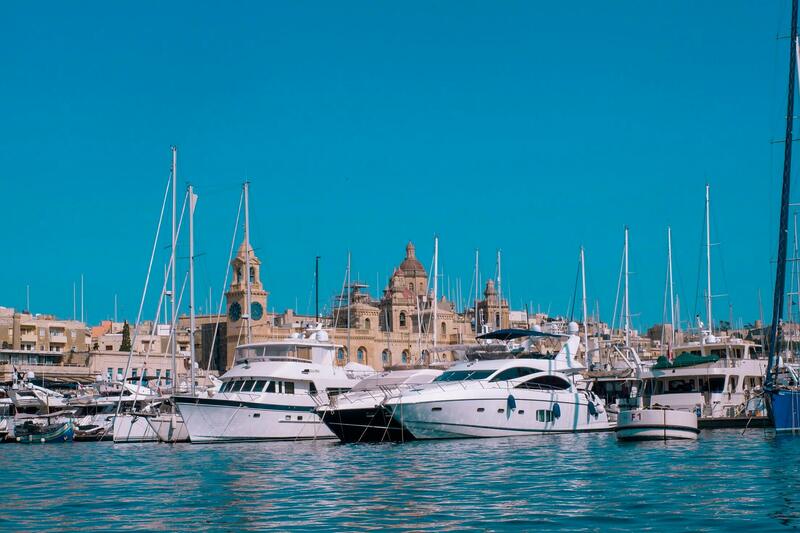 Sliema is a major area both for commercial establishments and residences. It can actually be a good base since it’s easy to get to Valletta (the capital) and other places from here. They have a transport hub of buses and ferries, too, and a great view of the capital city. Aside from high-end shops and restos, you will see a lot of street art as you round its blocks. 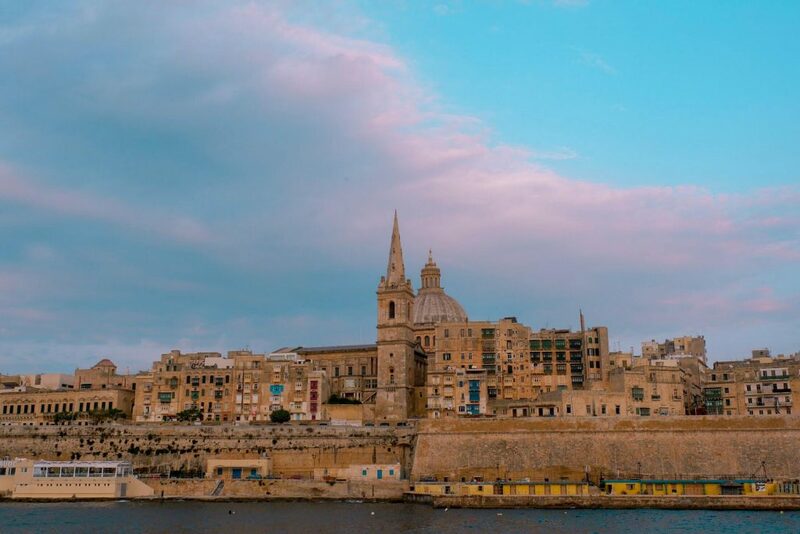 From here, we moved on to Valletta. There are two options to do so: by bus and by ferry. The bus option is cheaper (starts at 1.25 EUR), but it takes a longer route. The ferry is faster, but it starts at 1.50 EUR and goes up to 2.50 EUR. The scenery is better in the latter, though there’s not much time to enjoy it as you finish up the travel in around 5 minutes. 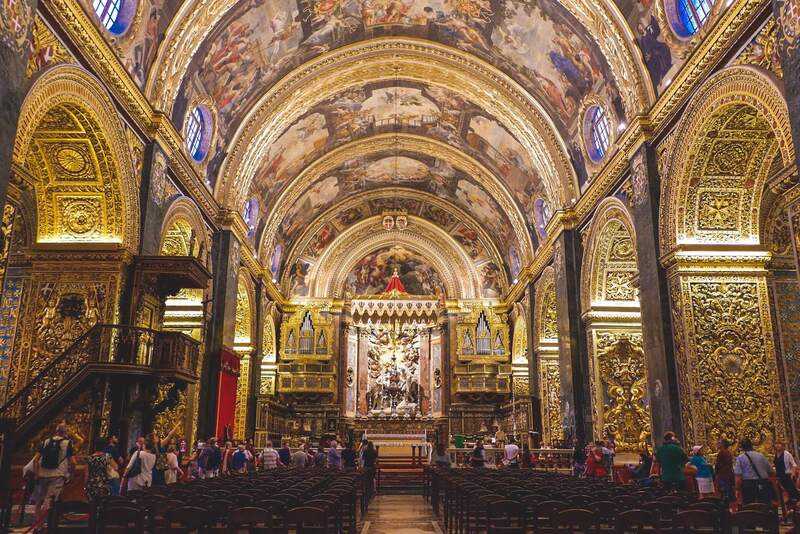 Valletta is known for its baroque structures, ranging from churches to museums and even palaces. Judging by its size on the map, it should have been easy to walk. However, we have been walking around it all day and we still didn’t get to see all the sights! St. John’s Cathedral. Once here, your first stop should be this late 1500s structure. It may not look much from the outside, but it is really big on the inside. We had actually skipped it on the first round, but we came back to it on a recommendation. And it’s a good thing we did! There’s an entrance fee of 10 EUR, but it was worth it. Highlights include 3 Caravaggio paintings. 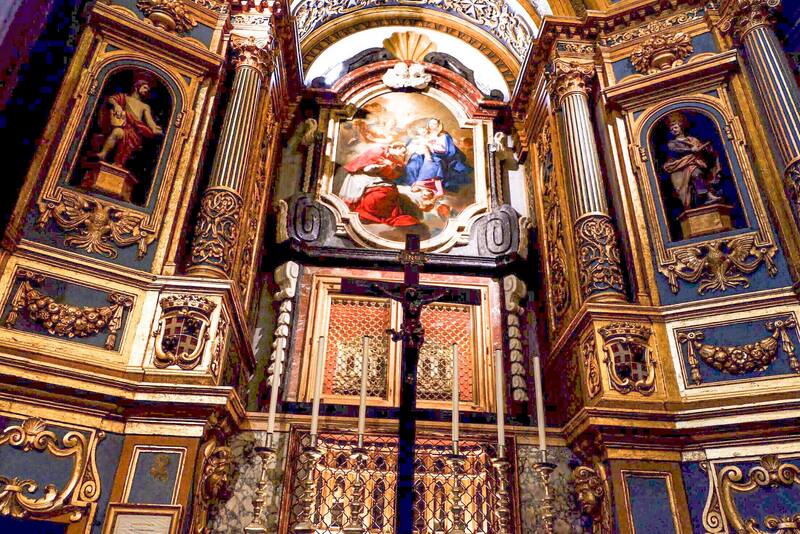 The Knights of Malta, who originally founded the Cathedral, wanted the church to match those in Rome so they spruced up the inside. Fort St. Elmo. Another must-see includes this fort, and its commanding War Museum. 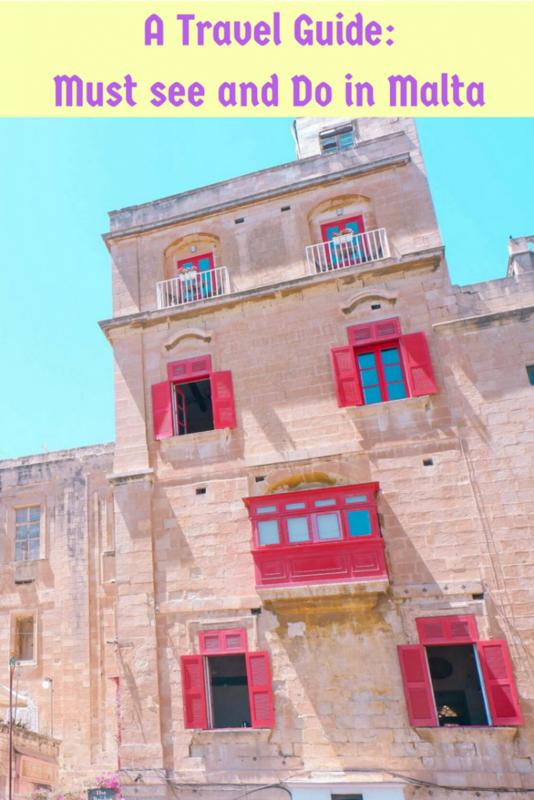 The fort has a historical significance by playing a major role in the 1565 Great Siege of Malta, withstanding Ottoman offensives for almost a month and buying other forts precious time to prepare. 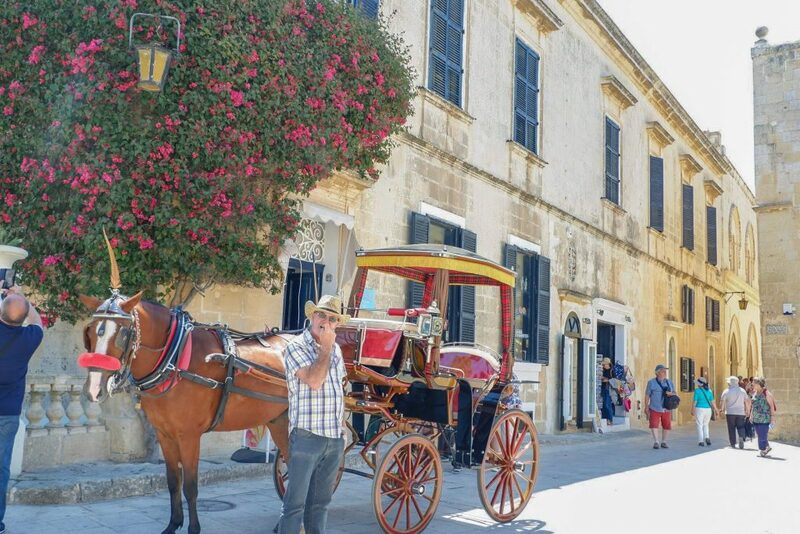 This is also the starting point for the historical tour aptly called The Malta Experience, which is a great way to get acquainted with the history of the place. Three Cities. 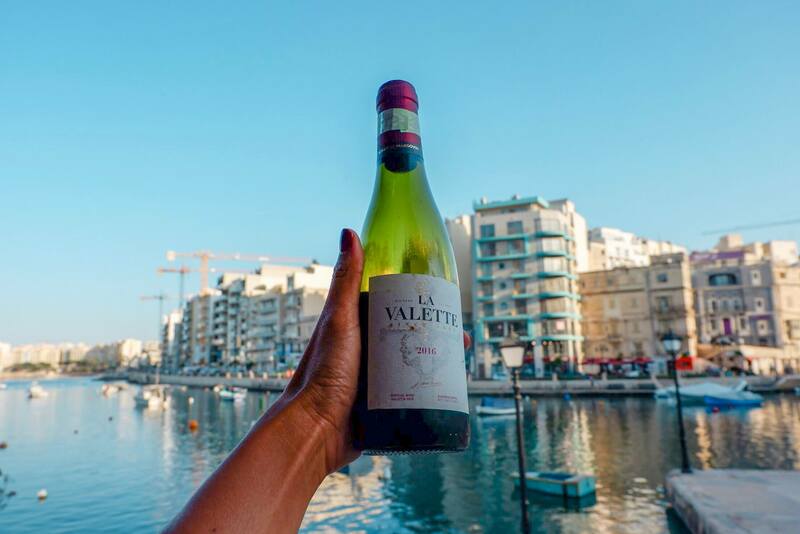 Finally, a trip to Valletta wouldn’t be complete without a trip to the Three Cities of Malta, which can be seen straight from the capital. As it says on the tin, these are three cities that are commonly collected into a single entity. 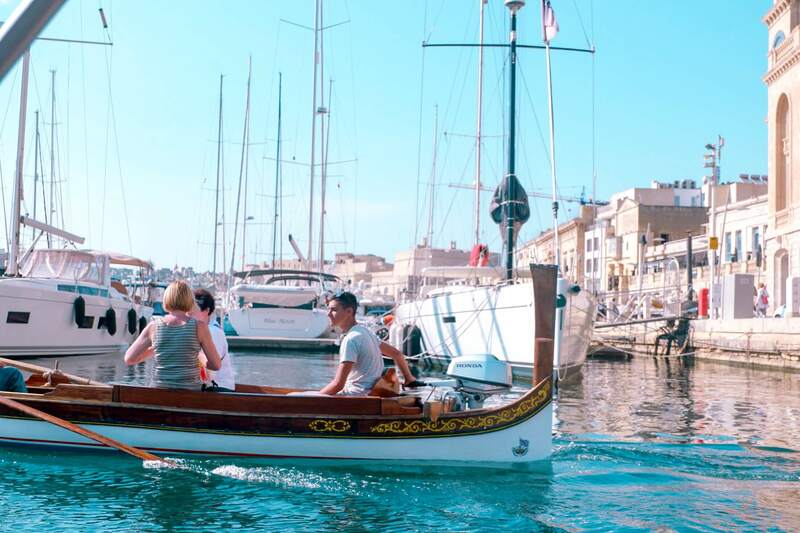 These three — Birgu, Senglea, and Cospicua — have been around since the Middle Ages. The easiest way to get there would be a ferry from Valletta, for only 1.50 EUR. 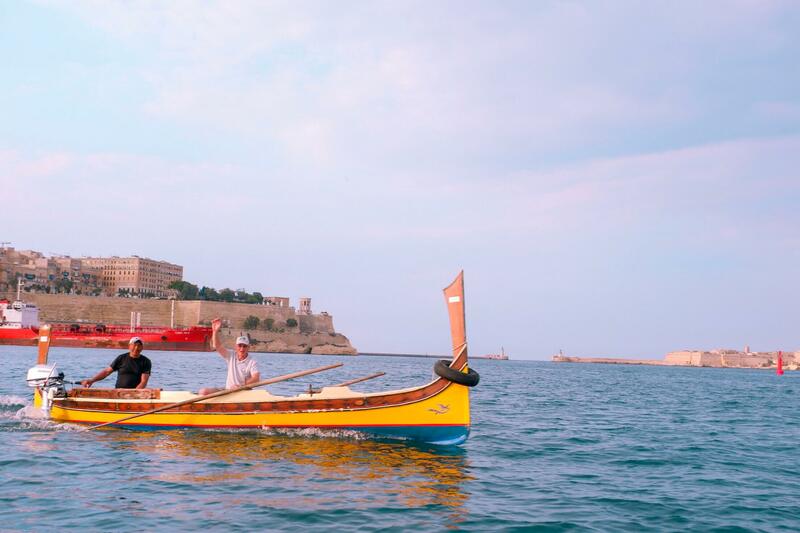 If you miss it for any reason, an alternative is to hire a traditional boat (just next to the ferry station). It’s just 2 EUR for a private boat, and the five-minute ride was a steal! Our funny driver/guide even sang for us during the trip! This doesn’t usually happen, but I was singing when I hopped on so I guess he got into it as well. When we got there, we didn’t realize it was nearly 6PM. The sun was still shining brightly, leading us to think it’s still early. Most of the tourist spots were already closed by then, but we did have a good meal for a decent price at a good restaurant. We had half a bottle of wine for only 7 EUR, and a sandwich for 3.50 EUR! The ambience was also amazing. After dinner, we walked the cute streets of the Three Cities, and it was great! There are also lots of beautiful places to see in the Three Cities. There’s the Cottonera Lines of fortification, the medieval castle Fort Saint Angelo, the Fort Saint Michael,and the Grand Harbor. 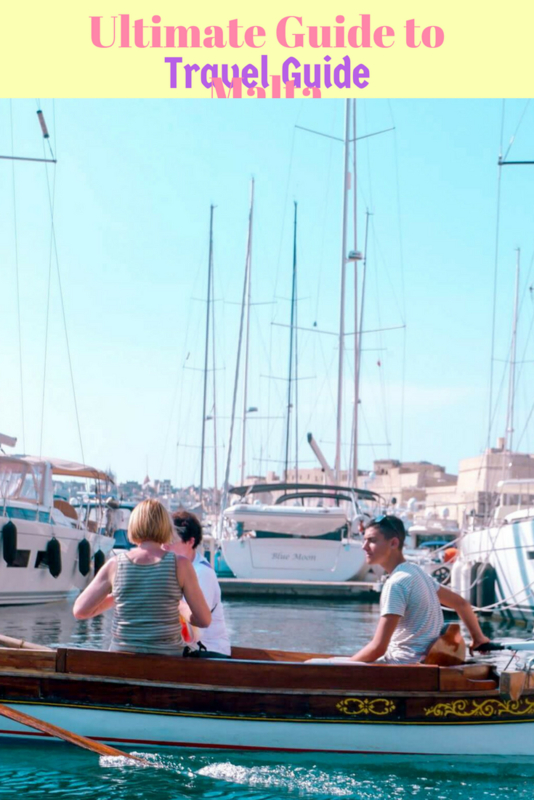 There are lots of tours headed to these sister islands coming from Sliema, but most of them cost around $35 and above. Aside from that, these are often massively packed. We had originally settled for them, but by a stroke of luck we had missed the departure time! It was poor planning, but it was all for the better. The way we did it, we went to the same places the tours got to with more space to go around and more free time to explore. From St. Julian’s, you can ride a bus (Bus 222). 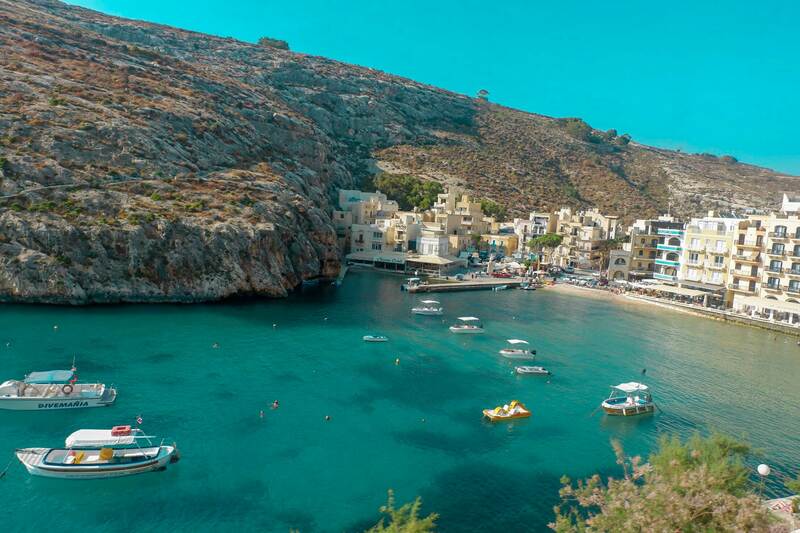 It takes almost an hour to get to Mellieha Bay, which is the last stop. This can also be a crowded ride since it passes through most of the beaches, so you’re lucky to get a seat. 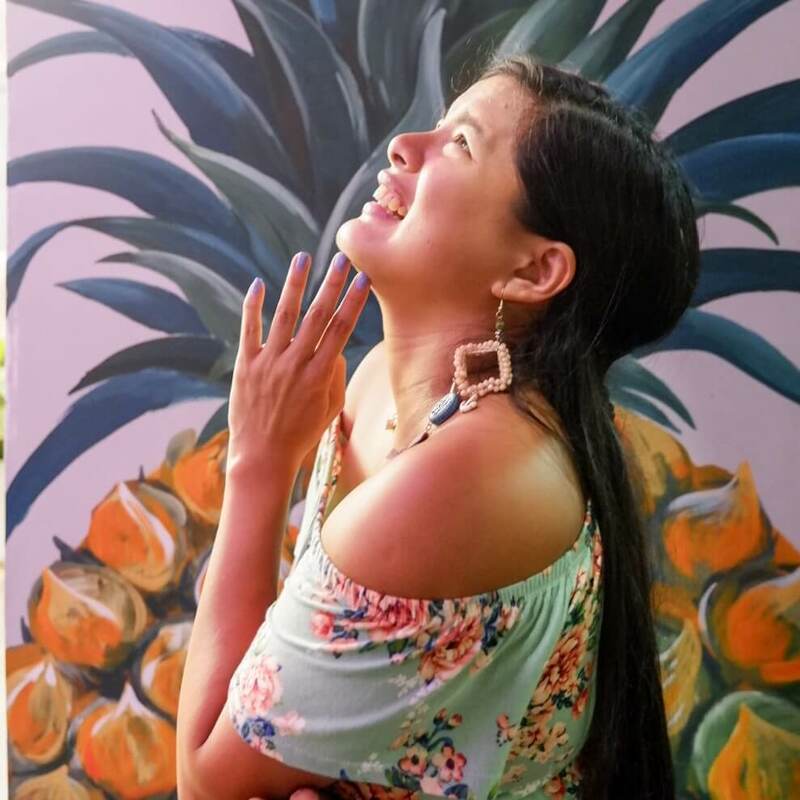 When you get to your destination, you may meet a lot of people who look like they’re trying to sell tours — but in reality, they are there to give information and to help you map out your plans! Once you get to Mellieha, there are 2 options. 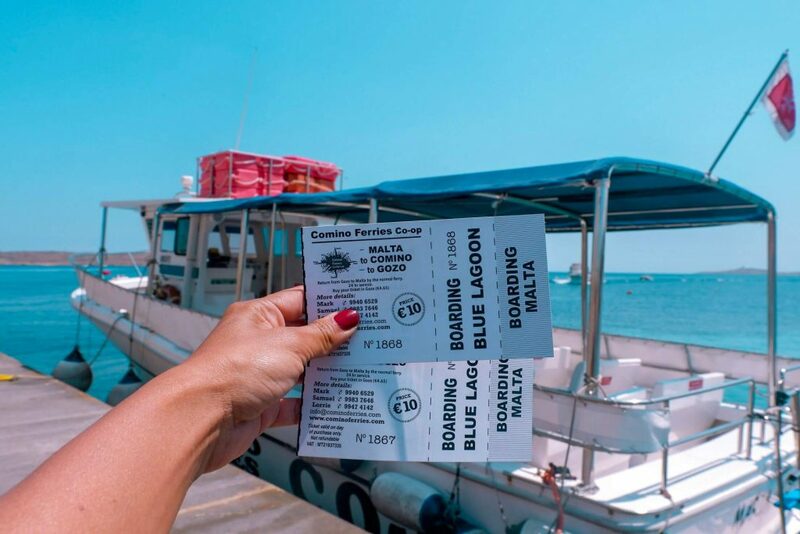 You can go to either Gozo or Comino, and pay 10 EUR for the return trip. 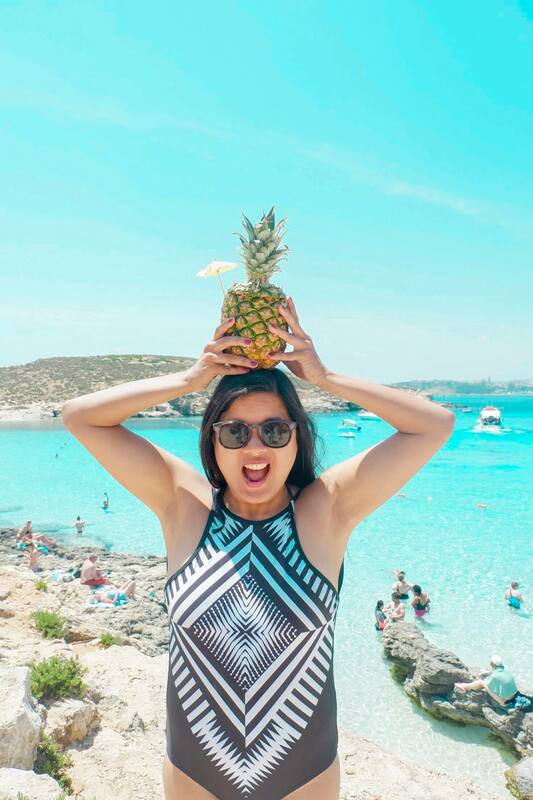 There is also one that goes to three islands (Gozo, Comino, and mainland Malta) for just 10 EUR! The ferry back to Malta is extra, so it costs 14.5 EUR, but it’s still a steal. 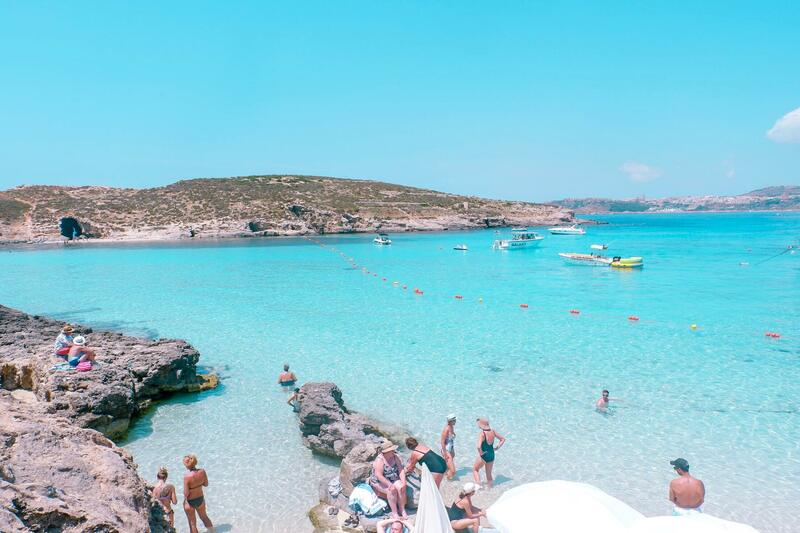 We went first to Comino, where a boat to Gozo departs every hour. This is a good decision, since afternoons in the island tend to be extremely crowded. 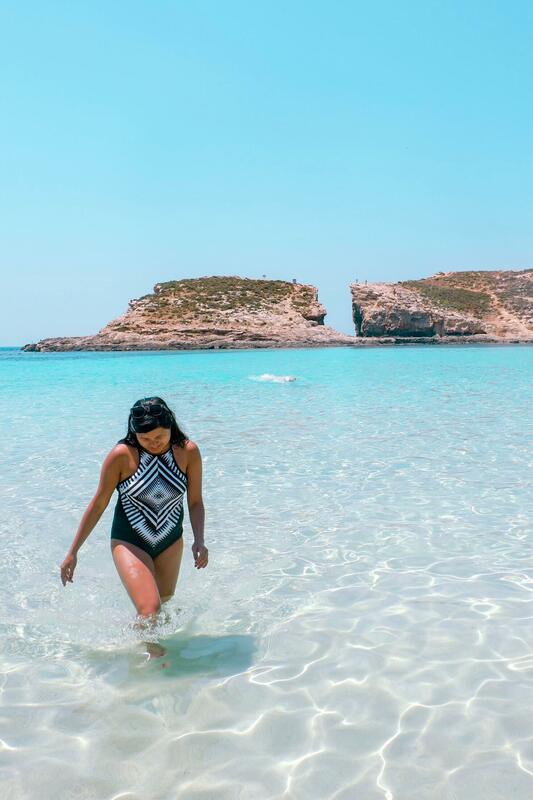 Lots of people go to Comino because it is considered a beach paradise, with great swimming and diving spots. The turquoise waters are beautiful, but the shore isn’t much to speak of. It’s better than in Greece, and in all my European tour, this is the only one that could almost compare to the beaches of the Philippines! The only downside is that the water is really cold. I thought I could have adjusted to it, but it just became colder and colder as I walked! There were also lockers, but it was already late when I learned of them. They would have been helpful, instead of leaving one from the group to watch over our stuff. The lockers are for 5 EUR for the whole day. I only learned about it when we bought the tourist-trap cocktail-inside-a-pineapple for 10 EUR! There are also sandwiches and salads at decent prices, along with normal drinks. For those looking for adventure, you can paraglide, parasail, and more! 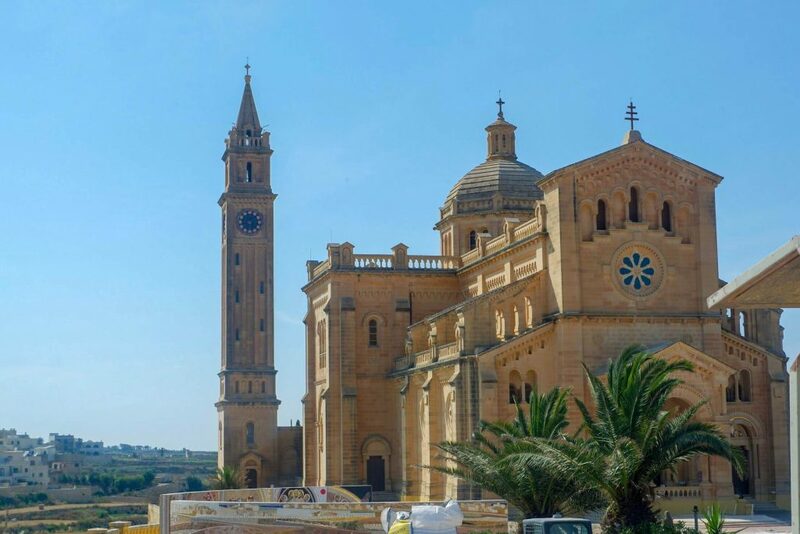 Gozo is the more historical of the two islands, with a rugged landscape dotted with churches and farmhouses. In the olden times, it was believed to be the mystic Isle of Calypso from the epic Odyssey of Homer. We took the Hop On, Hop Off here. We had a friend who commuted the day before, and though there are are buses you have to keep heading back to Mgarr (a small town up north). So aside from having to meet the schedule, it’s also physically tiring. A taxi could also be good, but since it was late when we got to the island the Hop On, Hop Off is a better deal. It’s 18 EUR per adult, but we got it at 18 EUR for both of us seeing as there are only 2-3 departures left, and we weren’t allowed to get off. There was an audio guide available, so we got the info we need for the island. I highly recommend this, so you don’t have to find things by yourself. It would also be great to spare a full day exploring the island, though in our case we lacked time. Xlendi Bay. I highly recommend this place, which is a fishing village with authentic fishing taverns and all the trappings! The food is priced a bit steeply, but Andrea and I had 2 pasta plates for 8 EUR each. Even if it was half size, we couldn’t finish it! The portions are huge. It comes with bread and 2 dips. The meal pairs best with beer or wine, too! I was 45 minutes well spent (all the time we had), and the sight of the bay was really pretty. Xewkija Church. This is the largest church here, and we stayed here for a 10 minute break. Afterwards, we moved on to a local bakery for another 10 minutes. Azure Window. Popularized by the Game of Thrones series, the place is a really pretty one. Sadly, the window itself is no longer there — it had been swept away by the ocean. We haven’t been able to get off here since it was late, but we saw it from afar. The tour ends in the ferry station, where you can easily head back to the mainland. The ferry leaves until late, but the last bus that departs from Malta to the city is at 9:30PM — you have to be there before then. 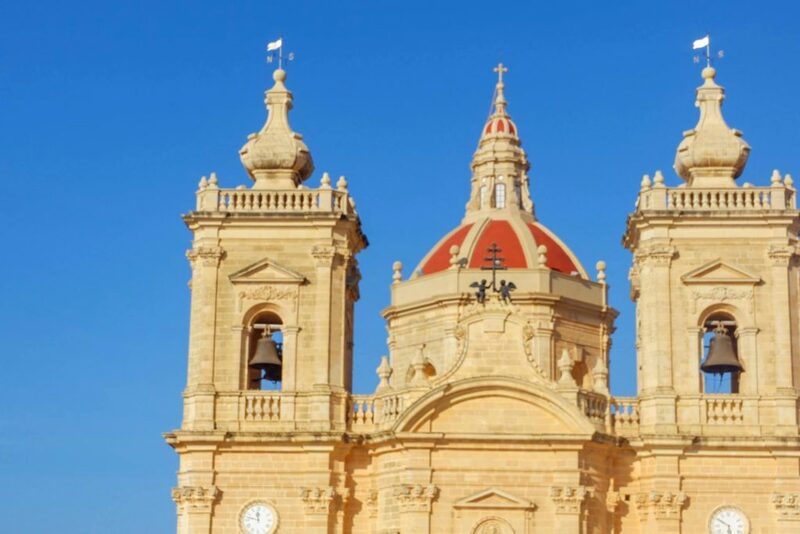 It takes 30 minutes from Gozo to Malta. 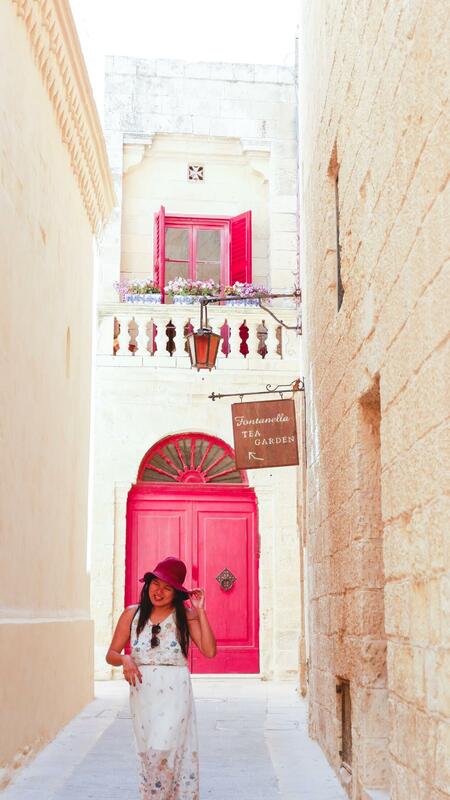 We started the last full day with Mdina, which is such a small town you can walk around it in 2-3 hours. There is a map that goes around it, and most sights can be found easily! 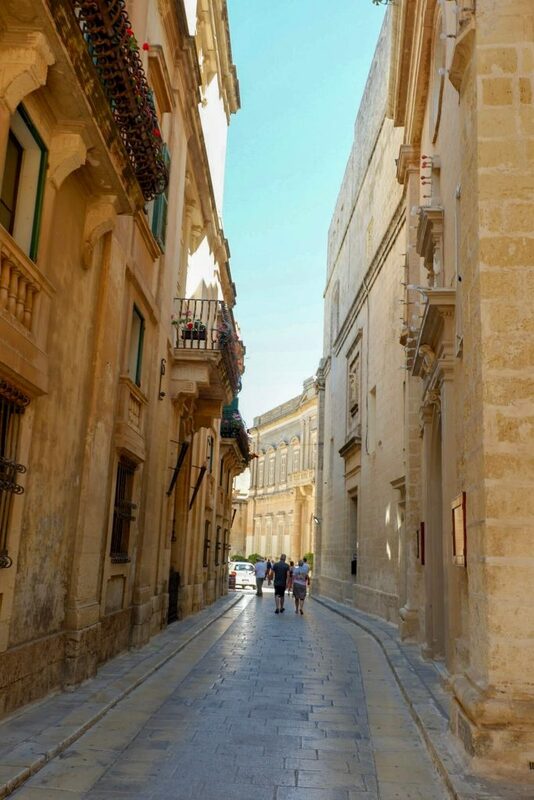 It’s an ancient town, which at one time had been the capital of Malta. 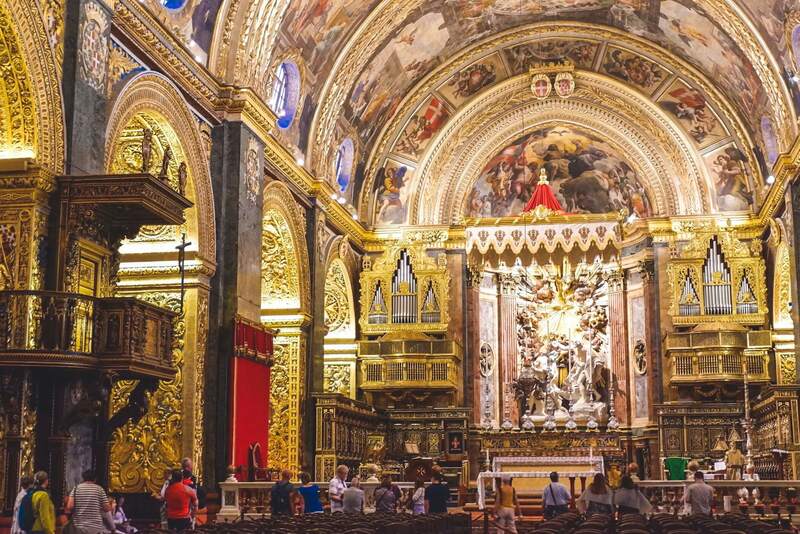 You can get here by taking a bus from Valletta (buses 51, 52, 53, 56). 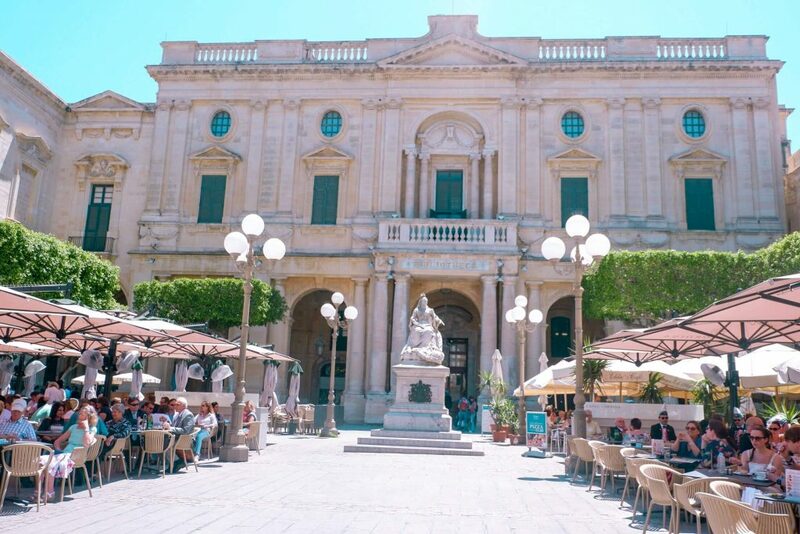 There are lots of sights around Mdina, such as the St. Paul’s Cathedral, the various chapels, the Mdina Gate and other gates along the walls, the various Palazzos, and the Banca Giuratale or Municipal Palace. 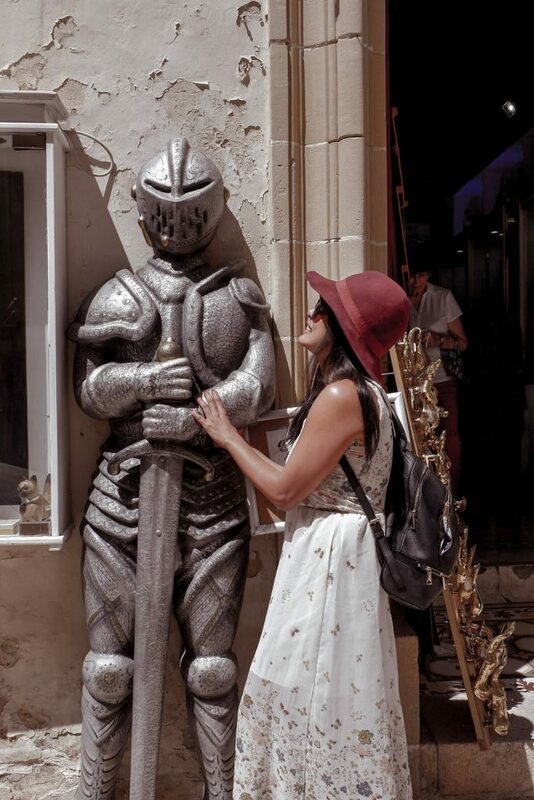 One of the best ways to experience the place is through the Knights of Malta and Mdina Experience. These are audio-visual experiences with a mini-museum tour that gives you a context of the place. These are separate, but you get a discount for booking together. Each exhibit lasts around 35 minutes. 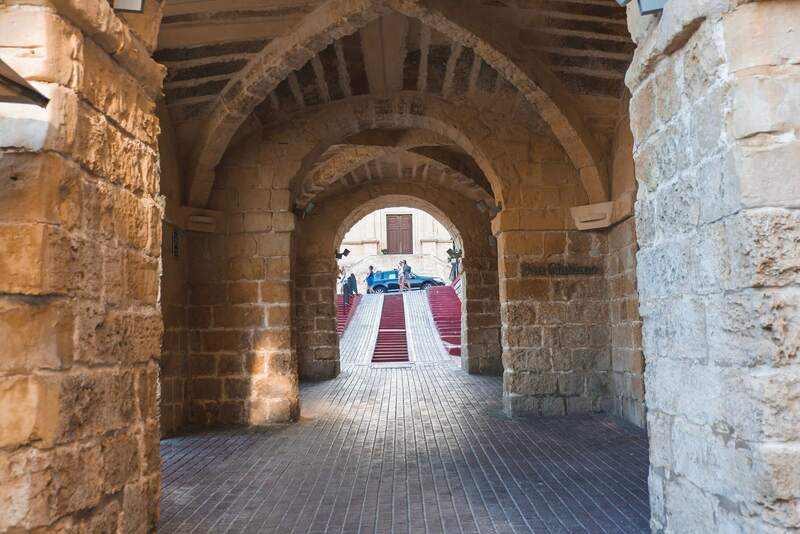 Through these, we learned a lot about the Order of the Knights of Malta and the general history of Mdina. 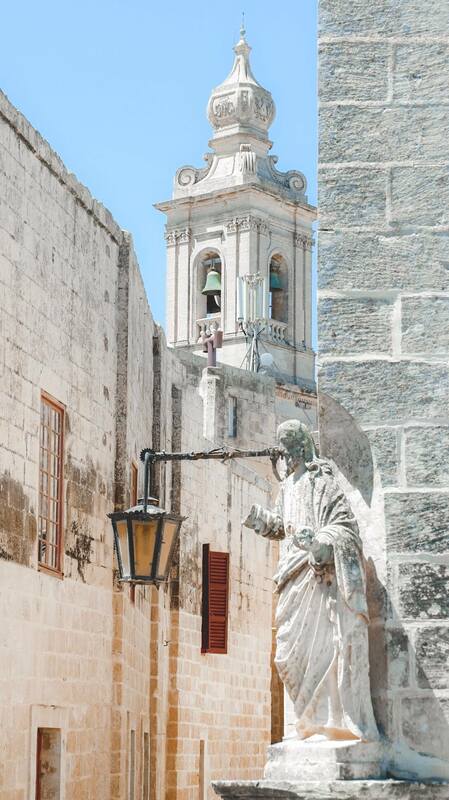 Just 5 minutes away from Mdina is another ancient town, with a lot of historical places. One of our stops was St. Paul’s Catacombs, which was said to be the largest in the nation. I wasn’t really impressed, though many people recommend this. Largely that was because many parts were closed when we were there. Also, the notes on the doors could have used more context. A guided tour or audio guide would also be nice, just like in the catacombs of Paris. An alternative is St. Agatha’s, which was smaller but had a tour. 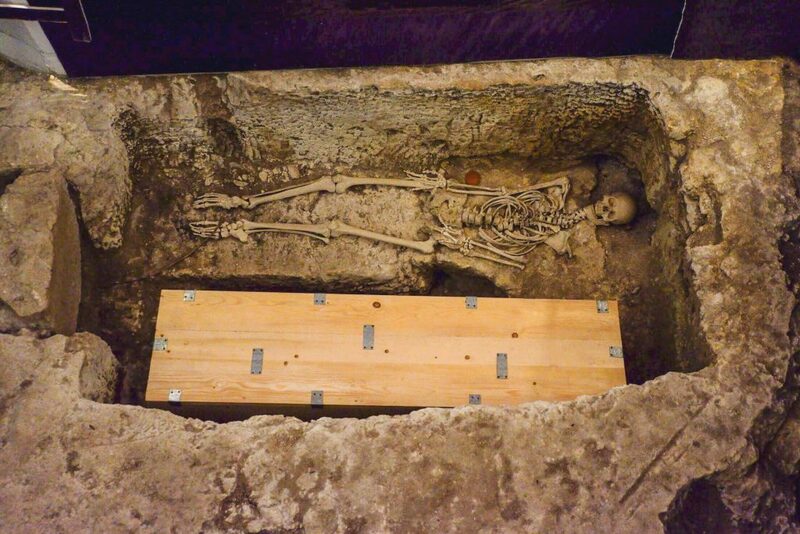 But for those who want to see a catacomb, the 5 EUR entrance fee might be worth it. We also visited the northern town of Mellieha, which is a famous summer destination. Within it is the Popeye Village, which was famous as the set of the 1980 Popeye musical. There are lots of activities around it for families, but it was fairly small and can be walked in around 5 minutes. There’s also the Golden Bay beach, with perfect sunsets and golden sands. This is perfect for just lying down and relaxing. 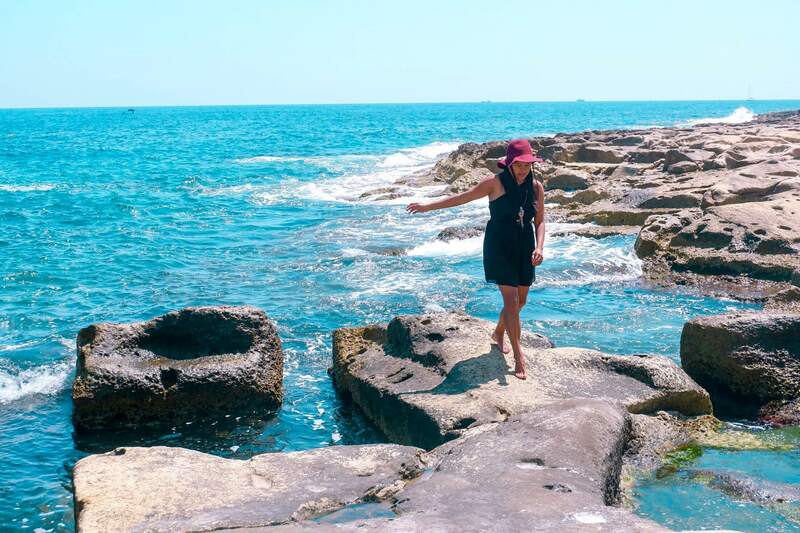 St. Julian’s and Sliema has similar points of relaxation, in the form of natural pools. Finally, there’s Paceville, west of St. Julian’s and a prime night-time spot. Many tourists flock here, and I’ve heard a lot of recommendations. Most came home at 6-8AM, including young people. We hadn’t had time to go there as we were exhausted (partly from partying in Greece), so we ended up having wine by the bay and within the hostel where we mingled with other guests. That was great, too! 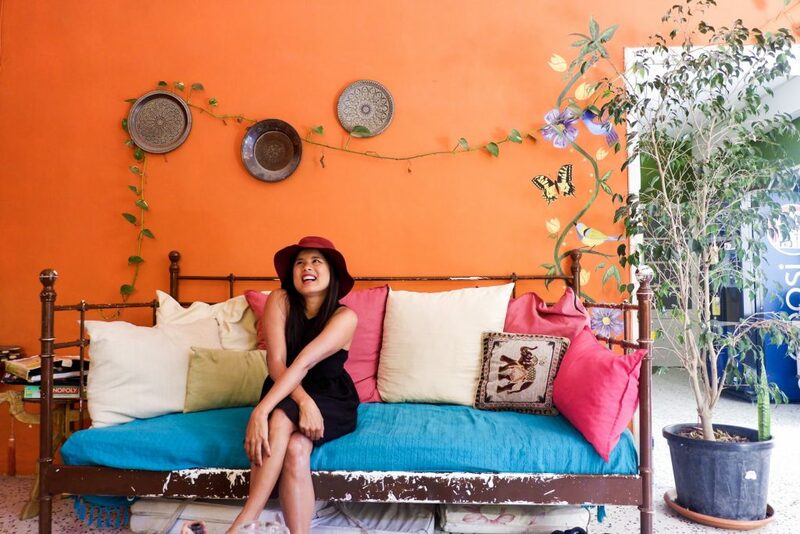 Speaking of the hostel, we stayed at the Boho Hostel where we had a really good time. I’m reserving a review for a future post so stay tuned! 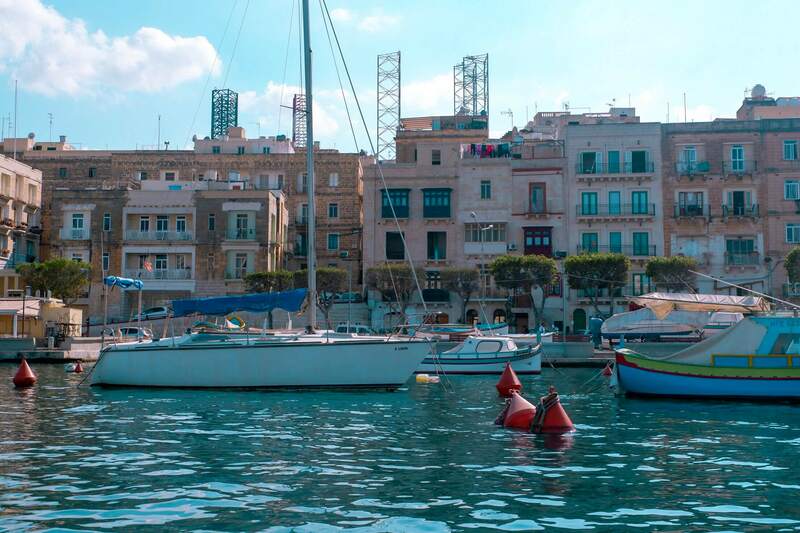 For such a small island nation, Malta has a lot to offer. It is richly steeped in history, and has a lot of beautiful jewels of nature! It’s a place worth visiting for more than the 3 full days we stayed there. I’ve been to Malta last year. 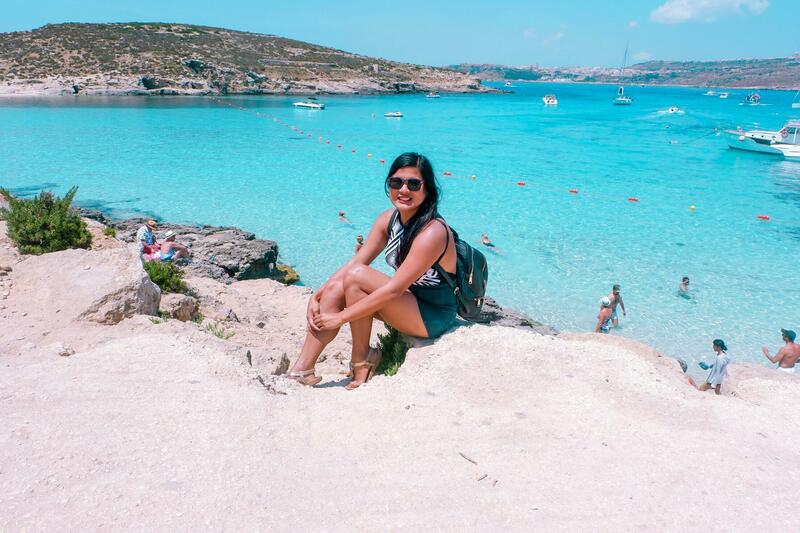 I visited comino and gozo. 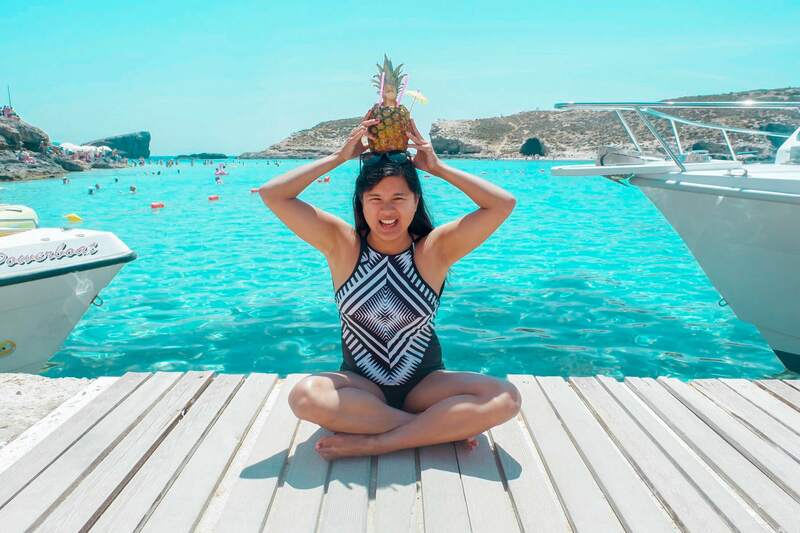 A week is not enough to travel around beautiful places in Malta that is why I’m planning on going back in Malta but this time with my friend this coming May. I will make this trip the best memorable trip of my life. Good to know from the start that Malta deserves at least a week, rather than a few days. 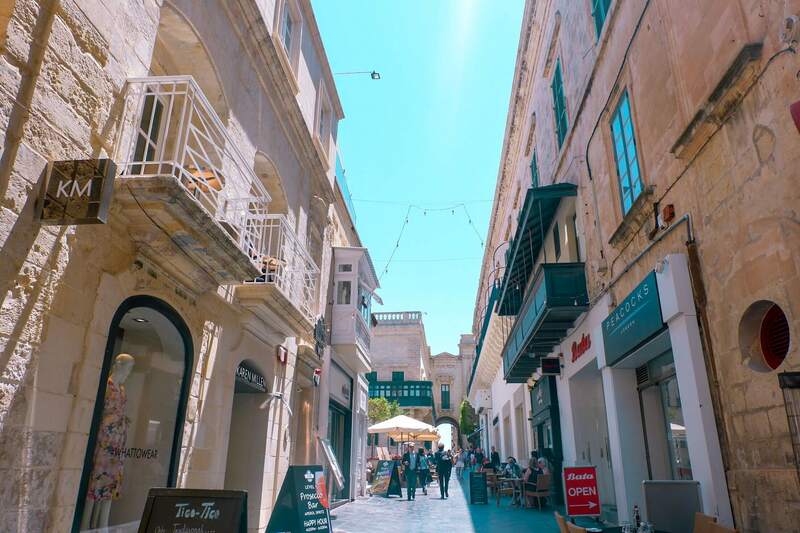 I can see there’s plenty to see and do, for me a key attraction is in the old city architecture of Valetta, Mdina and Rabat though of course I’d want to explore other places too. 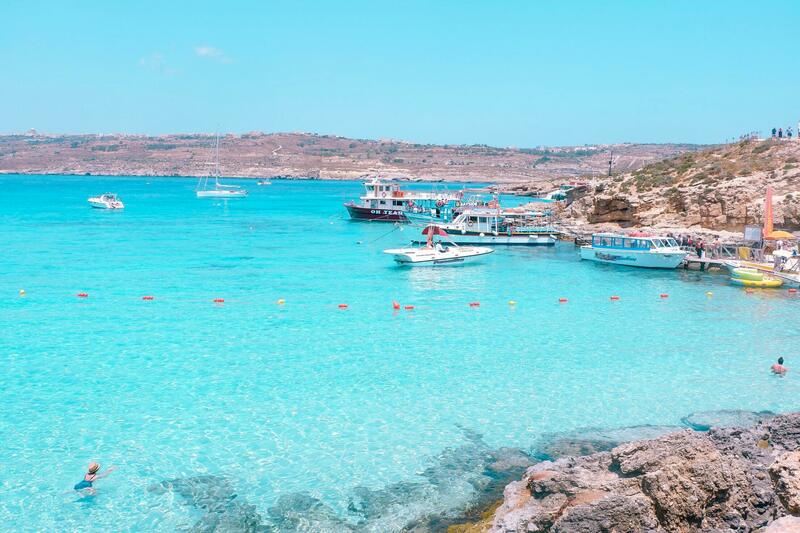 Being able to enjoy the sea and visit Gozo and Comino definitely appeals. Whew! Sounds like you had a full 3-day trip indeed! Good to know that there are plenty of places to see in just 3 days. 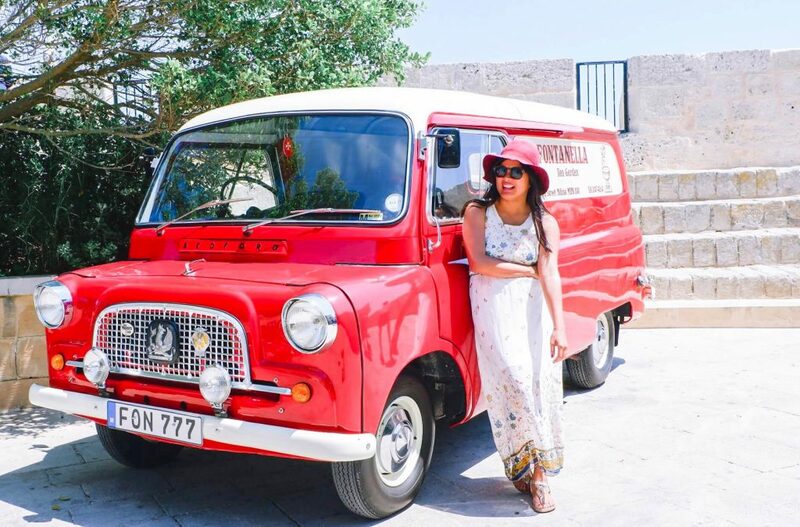 The Hop On Hop Off Bus in Gozo sounds really perfect to get to know the island. The beach in Camino also looks inviting. Except of course the temperature. LOL. Too bad about the lockers. It would’ve been pretty convenient if you were able to keep your things there while enjoying the beach. 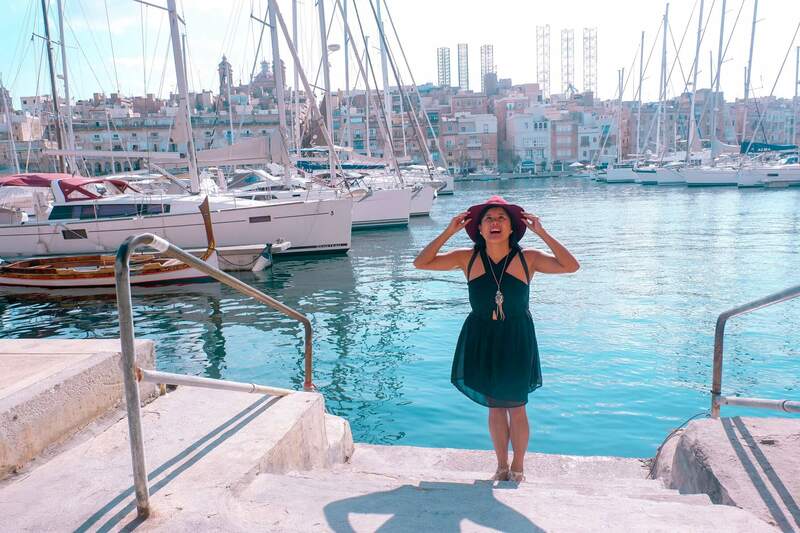 I love Malta and have fantastic memories from this charming little island. Would love to go back one day. Totally agree with your guide for those looking at going to the island. It has so much history, great food and the locals are wonderful. I learned about the Siege of Malta at the Museum of the Order of St John in London. Your pictures bring it to life, in a way, because I can see where it happened. 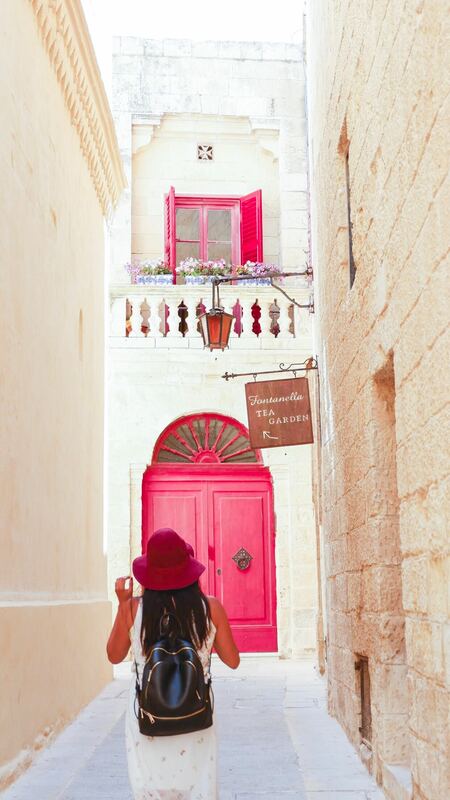 Malta looks amazing! 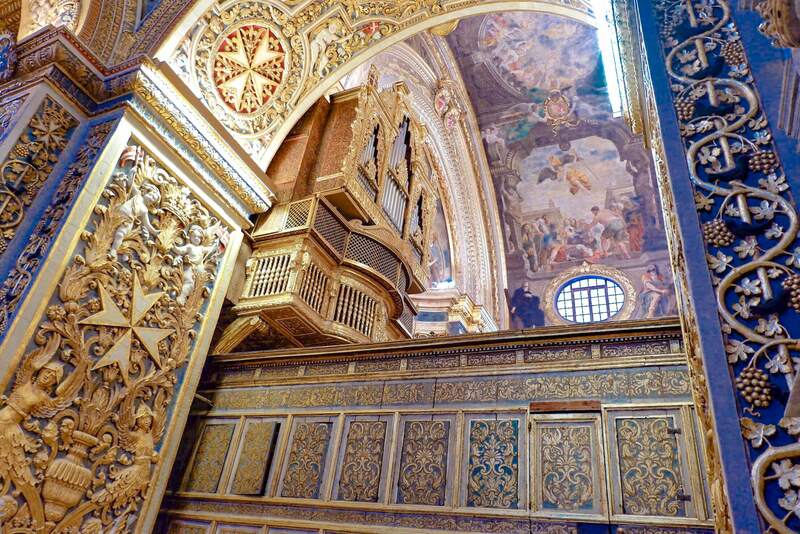 I love it when places exceed my expectations, like St. John’s Cathedral – it goes to show that exploring things you wouldn’t do normally is often totally worth it! And having personal recommendations helps a lot too. 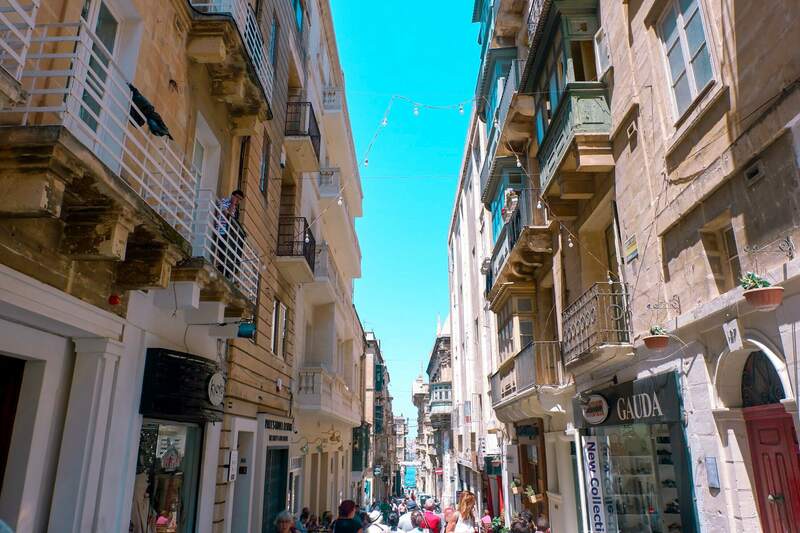 Malta has so much to offer and I think it definitely deserves a week time. 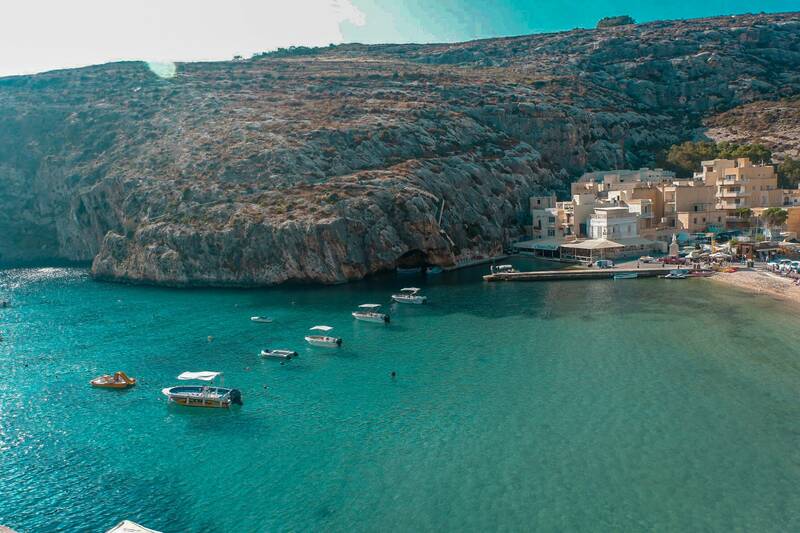 The Hop On Hop Off Bus in Gozo is a perfect option to explore the island. Old city architecture looks quite impressive too. I love your pictures and you add life to them. Hope to see you soon girl. Malta sounds like a great place to visit. 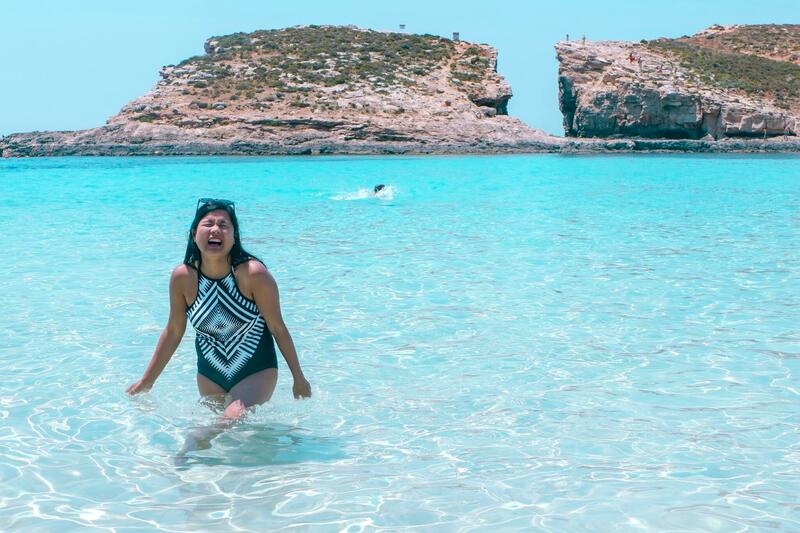 It’s too bad the waters were cold in Comino. 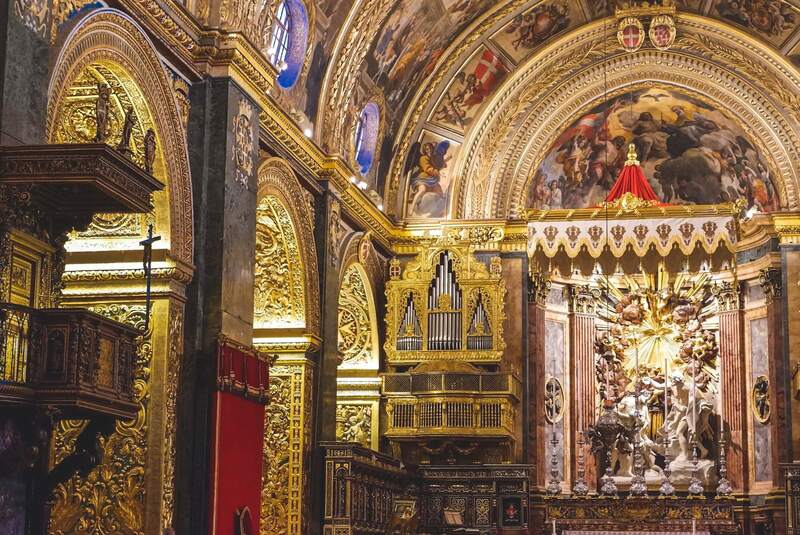 The audio-visual tours of Malta sounds like a fun way to learn some history. 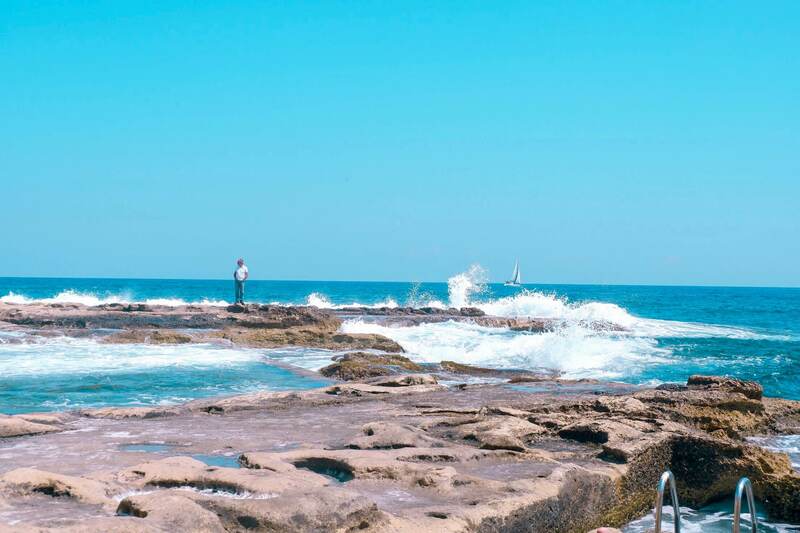 With so much to see and do, it’s no wonder you could have used a few more days to explore. 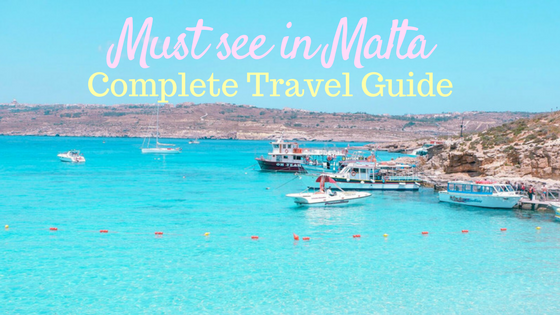 This is a really good guide of Malta! There’s just so much culture! I want to visit this island soon! You should defintely visit Malta. Which one do you like so far? Perhaps I can help you more if you have more questions? We just patiently waiting till it cleared —- you get some moments where you find alleys and streets with few people. Of course the main one will be crowded but yeah. 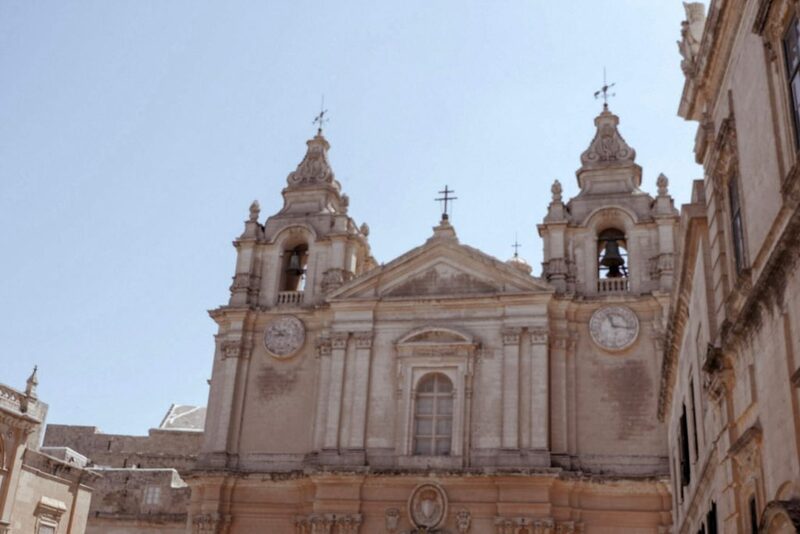 I love the baroque structures in Valletta! 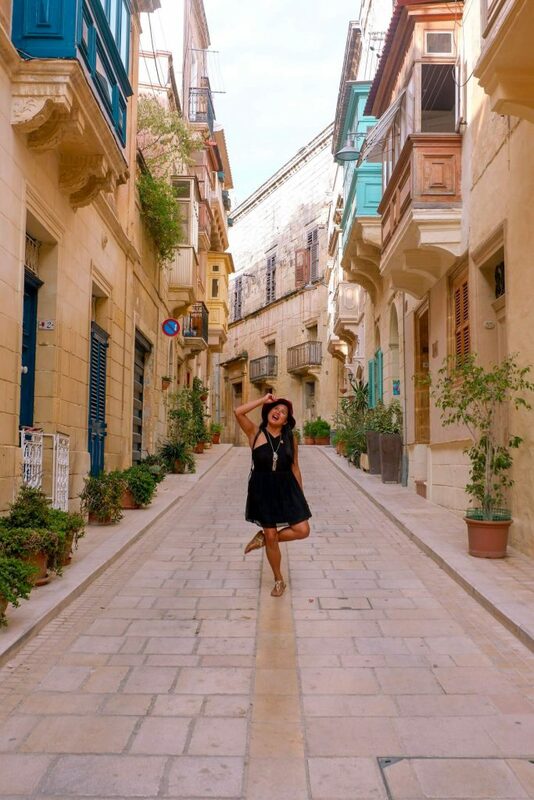 Malta has been on my bucket list for the last 2 years, since I saw such lovely historical architecture and beautiful beaches on my friend’s instagram page. 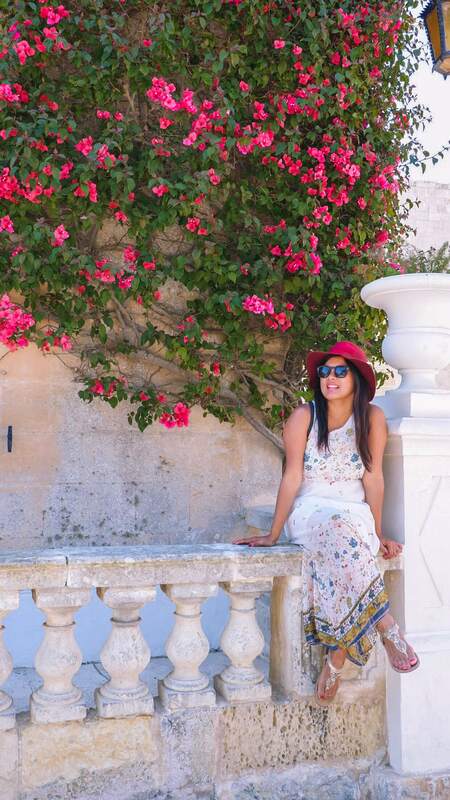 Your pictures in ancient Malta are gorgeous and this is where I’d like to spend more of my time. Thank you for the recommendation on using Tallinja app. I always find these local apps very helpful! The Tallinja app was definitely very useful for me. Malta wasn’t really part of my itinerary but I’m glad I went. If not for Game of Thrones, we wouldn’t have gone— but seeing it— obviously, I am glad I did. Most especially since it is relatively easy on the pocket. 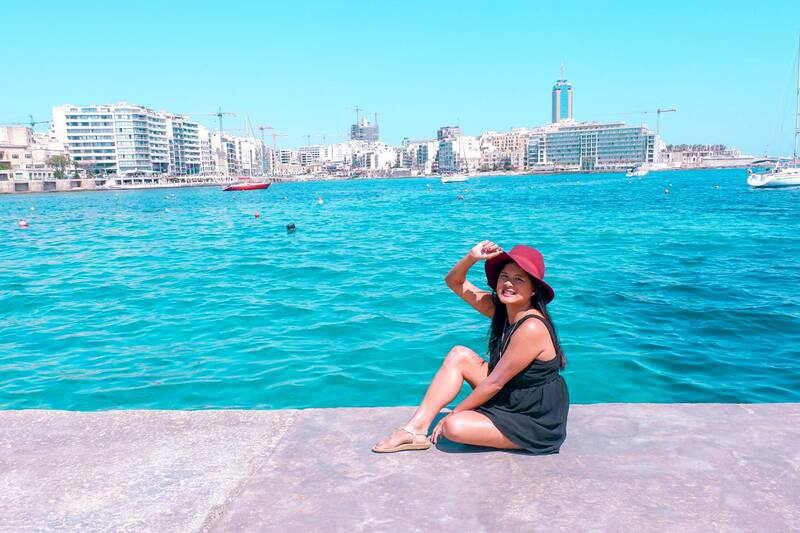 Valletta is amazing— and the beach has clear blue waters— It’s really worth it.